What Are Micro SDHC, And What Are They Used For? You are here: Home › Technology › What Are Micro SDHC, And What Are They Used For? With newer storage technology moving into the world faster than the blink of an eye, we are often at a loss to know what the latest technology solutions are or what functions and features they offer. At the same time, you would not want to know the latest storage solutions in the market that would offer you more volume or storage solution at cheaper costs. As the term signifies, these are data storage cards that are higher capacity and faster solutions for storing voluminous data. This new class of storage solution is a step up from micro SD memory cards. 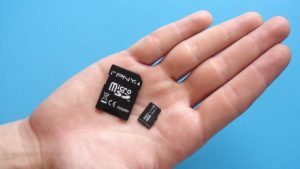 There are many mobile and computer accessory devices that can read micro SDHC as well as microSD cards. However, micro SDHC stands for high capacity which might require specialised devices and might not work with those that are compatible with microSD. These storage cards are a step up from mini SD cards. Being based on the SD card format, these are usually 15 mm x 11 mm which is the size of a small finger fingernail. These are ideally perfect for the latest smartphones in the market. The microSDHC formats are cards that can take on data upto 32 GB. SD cards work with devices that can handle SDHC but the vice versa is not always applicable. SD cards come with capacities like 4, 8, 16, 32 and others upto 2GB whereas SDHC cards are usually of storage capacity 4GB and more, usually upto 32 GB. SDDHC cards have been devised in order to store HD videos which are shot at high resolution. Such recording that is done on phones and cameras usually require such storage mechanisms. SD cards and SDHC ones are similar in shape and size but SDHC meet new specifications of version 2.0. If you are using a SD card of 2GB and more, it would be classified as SDHC. The speed class rating is distinct for SDHC than ordinary SD cards. Hence, if you are opting for a class 2 SD card, it would offer writing speed of 2MB/s or higher. This principle defines other class categories of SDHC cards which can be of class 4, 6 or 10. There are certain points to know when you are trying to use SDHC cards. For instance, if a device is compatible with speed class 4 of SD cards, you can use SDHC cards of class 4, 6 or 10 but you need to refrain from using SDHC of class 2 which will undermine the performance of the camera or the phone. Devices that have been manufactured before 2007 might not be compatible with SDHC cards. If you are making a new device purchase look out for the SDHC logo that is usually on the product or mentioned in the user guide.